Triathlon Wetsuits: Your Questions Answered! We sat down with triathlete, Adam Himmelwright, to answer some frequently asked triathlon wetsuit questions! 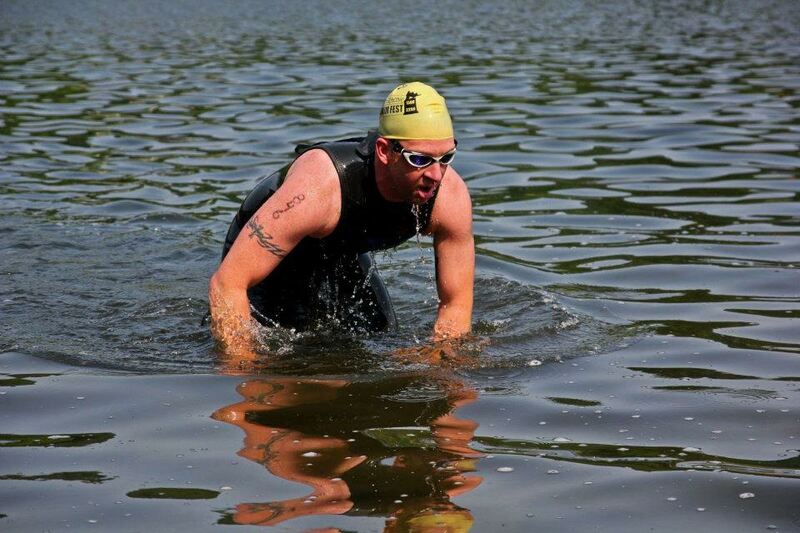 With seven years of triathlon experience, Adam is a 2015 Eagleman 70.3 finisher and a Great Chesapeake Bay Swim finisher! Yes, I can definitely feel the difference. Buoyancy is the ability to float. It’s not uncommon for your legs to sink, but first timers will tell you that when they put on that wetsuit and get in the water, they notice that their core and especially their legs are further up in the water. Subsequently, you feel more mobile, a little faster and you create less drag that way. Why wear a triathlon suit? Buoyancy is the most important feature of wearing a triathlon wetsuit. First timers will tell you that wearing a triathlon suit definitely takes the edge off. Warmth is another really practical thing about wearing a triathlon suit, along with movement and mobility. Triathlon suits are as diverse as they need to be in order to best equip you for such a wide combination of elements per transition. How should a triathlon wetsuit fit? A wetsuit should fit snug, like a glove. I like to wear a sleeveless wetsuit as my suit of choice. I like it to be pretty tight; I don’t like to shift around a lot. My first wetsuit rental was way too big, you could actually feel water rushing in through the neck and all the way out through the toes, it created a lot of drag. So, when I actually bought my first suit, I made sure that it was the proper fit to prohibit that from happening again. We’ve even created a nifty how-to guide to better help you choose your wetsuit size! How tight should my triathlon wetsuit be? If your suit is too tight, it’ll be restricting and will compromise your breathing. Once again, the shoulders are the most important aspect in regard to mobility, you need to be sure you can move your shoulders comfortably without it being too loose. As mentioned above, there are tips on choosing a wetsuit size, if you find yourself needing more direction! What triathlon wetsuit should I buy? It depends on the competition as well as water temperatures. My best fitting suit which I like a lot is the blueseventy Fusion; it’s a full-sleeve triathlon suit, great for temperatures under 60 degrees, you really don’t even notice the temperature. My other suit is an entry-level Long John and it does the job. I tend to overheat easily, so I don’t prefer to wear my fullsuit all the time. You really have to adapt and learn about yourself as a swimmer and triathlete. Can I use my triathlon wetsuit for surfing? I don’t recommend it. Triathlon suits are very delicate and would most likely tear if worn while surfing. On the other hand, surfing suits lack the buoyancy you will need while competing in a triathlon, while surfing or general water sport wetsuits are not flexible enough for swimming, and will be more likely to cause chaffing. Can I do my triathlon swim without a wetsuit? 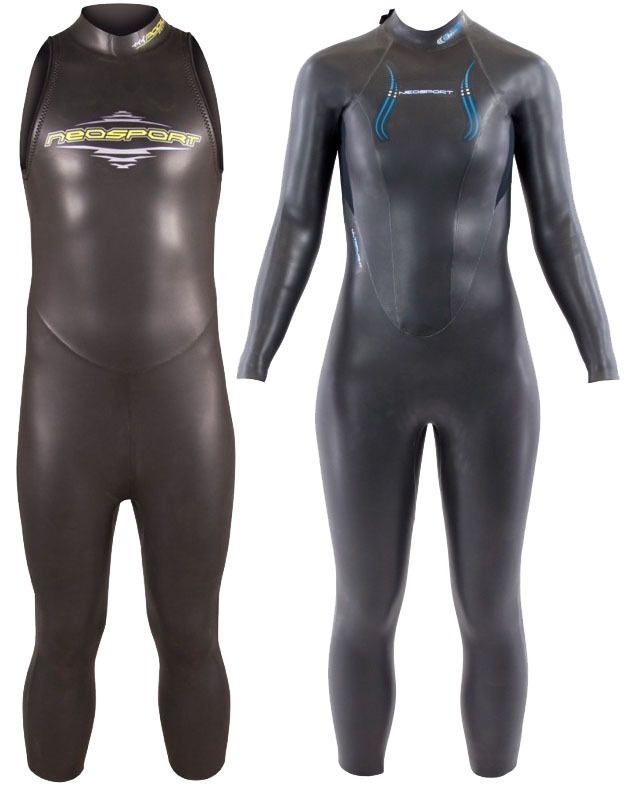 Do you have a preference and would you compete without a wetsuit? Absolutely, I’ve done several that way. And if it’s a wetsuit legal swim, I’ll wear a wetsuit, depending on the race and the temperature. USAT’s (United States of America Triathlon) regulations are under 78 degrees, pretty much everyone competing at that point will wear a wetsuit. On a competitive level, I’ll wear one because my speed increases, but I do have to pace myself in terms of effort so that I don’t overheat. As far as open water swim, I prefer not to wear a wetsuit. In my opinion it’s the best way to go, it’s just raw and fun to do. No competitive advantage or disadvantage there. How do I transition with a wetsuit? In terms of transitioning from swim to cycling, as soon as I get out of the water, I start to transition. I just reach back and grab the zipper pull. By the time I get into transition, usually the top half is already off. It’s difficult to run and take your legs out at the same time. I usually work on the top half while in motion, and then I sit down and begin to pull my legs out. I’ve seen plenty of people with plenty of different methods, whether they stand and push the material down with the other leg or sit down and tug at the ankle, it is definitely a multi-tasking function. It takes a long time to master and is trial and error. Triathlon Wetsuit vs. Regular Wetsuit? Whether you’ve got a fullsuit or a long john (or jane) triathlon suit, they are, hands down, the best suits for swimming! Remember: buoyancy, warmth and flexibility! Should I wear a triathlon sleeveless or fullsuit? There are a few factors. Again, temperature. If you’re in warmer waters, you don’t want to race wearing a fullsuit. Triathlon suits come in either fullsuits or sleeveless. Fullsuits are suggested for temperatures below 60 degrees, but if temperatures permit, most swimmers prefer the freedom of movement of a john. When should I wear a triathlon wetsuit? Any time you’re in water 70 degrees or below you’d definitely want to wear a wetsuit. I also recommend wearing your suit to all of your practice swims to practice getting in and out of your suit so that you know where all of your issues occur, to ensure your fit, and to make sure your transitions go as smoothly as possible. Have any more questions? Or maybe you just want to chat with us some more and share your ideas? Wetsuit Wearhouse staff is always on standby via phone (866-906-7848), email (service@wetsuitwearhouse.com) or live chat! Hit us up with your comments below and remember to always TRI your best! Check out our other articles where we answer more top wetsuit questions! When Paige is away from Wetsuit Wearhouse, you can find her by following the sound of rock ‘n roll and the call of the open road. She’s probably cruising around in the sun, likely to be doing something outdoors, picking through flea markets, reading or crafting.